Now that you know how to make a perfect cup of tea (and if you don't, scroll on down the page to find out), you need something to go with it -- and the perfect "something" is a scone. Sift flour and add baking powder, salt and sugar. Cut in margarine with a pastry cutter or two knives. Add raisins or sultanas or dates if desired, and stir to coat them with flour. Mix milk with beaten egg and stir mixture into dry ingredients. Gather dough into a ball. Knead lightly and roll to 1/2 inch thickness on floured board. Cut into circles or other shapes as desired and place on a lightly greased baking sheet so they do not touch. Bake at 450 degrees for 10 minutes or till golden. While scones are baking, pour whipping cream into chilled bowl and whip with chilled beaters till the cream is very stiff and almost buttery. Serve scones immediately after baking; they lose much of their flavor within half an hour. 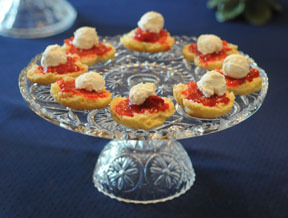 Let your guests split each scone horizontally and top with whipped cream and jam. 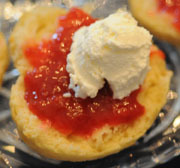 There's a rumor that the only reason scones were invented was to transport the weight of jam and English clotted cream (a very rich whipped cream) from one's tea plate to one's mouth. In fact, the combination of sweet biscuit, cream, and jam is so delicious that your guests will think you slaved over the scones for hours, but in fact they're as sinfully easy as they are good. I must admit, however, that sometimes I say modestly, "You wouldn't believe how much effort it takes to make these."